Renowned American sociologist, Charles Horton Cooley once said “An artist cannot fail; it is a success to be one”. This is exactly what Serge Attukwei Clottey is doing by transforming plastic waste into impressive artworks to create jobs, generate wealth and protect the environment in his endeavor. As a son of a Senior artist, Serge grew up with the talent and further sharpened it with tutorials from the Ghanatta School of Art, a move that has today taken him places. His amazing works have earned him both a local and an international reputation. He also studied at the Escola Guinard University of Art in Brazil and has completed multiple fellowships abroad. Serge Attukwei Clottey, an emerging art genius is converting plastic bottle used for storing cooking oil into fashionable and artistic carpets with the aim of creating jobs and wealth. ”My community plays a huge part in my work because it serves as my material source and space for production. My work highlights issues about the environment”. He believes his work is playing a critical role in finding solutions to the plastic waste problems bedeviling the country. Serge is working around the clock to create jobs for the youth who are idle in his La community. 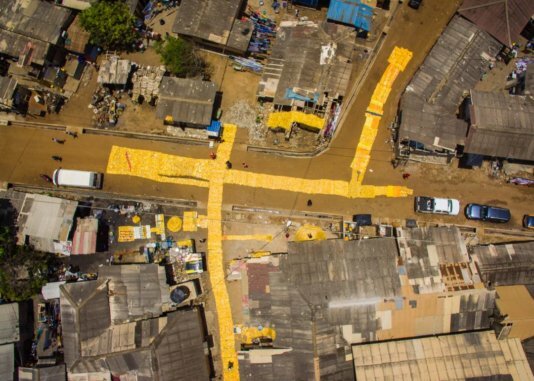 He cuts the yellow gallons known in Ghana as the "Kufuor gallon" and develops square pegs from the jerrycans, - and then sewn together to form large plastic carpets that are usually exhibited at his workshop on Mondays. 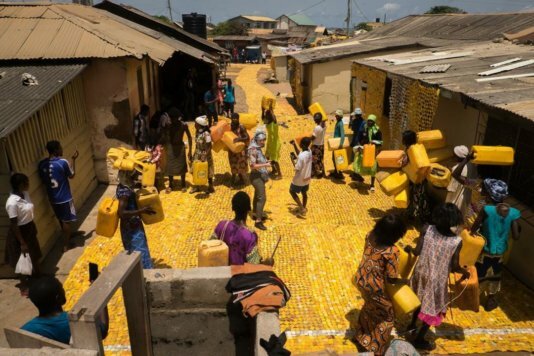 Clottey estimates that he has used 30,000 Kufuor gallons since 2005 when he started using them in his artwork and 3,000 of them have gone into the yellow-brick road project that began in 2015. 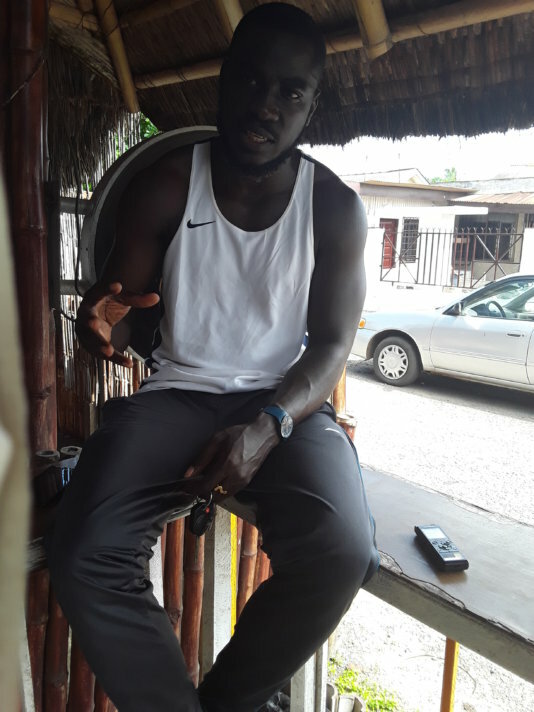 Indefatigable Attukwei Clottey says he currently has about 15 young men and women working directly for him and dozens of others who go round to collect the plastic waste materials for the execution of the project and they are paid adequately for work done “I can’t authoritatively tell if this project is going to be the solution to plastic waste but at least we are taking that step to get the action initiated”. I have worked with plastics for about 15 years because it create awareness. My focus is on the “Yellow gallons” this type of plastic takes a long time to decay and we need to get them out of the environment to make us safe." He says he is more interested in how these yellow gallons that are imported into the country could be sent back to their country of origin in a different form and value without having any negative effect on the environment whilst generating revenue for Ghanaians. "I am interested in researching the background of that object that comes from the West as cooking oil. Oil is a need and we store water in the gallons after emptying the oil. The question is do we send the same object back to the producing countries and how would that benefit my country Ghana? I believe that transforming this objects into my artistic project will rather benefit the country in terms of revenue generation and job creation while protecting the environment." “So what I am interested in is how government can support me expand my operation since we are all working to restore the climate to its natural state. The fight against climate change requires that we work together. It will also help provide job for the youth since more would be employed through our expansion drive. This way, they wouldn’t depend more on their parents and other people for money. This will also save them from engaging in criminal activities. It also helps to protect and sanitize the environment”. “This is a critical approach to plastic waste management because it brings value to the country. It’s not just about collecting plastics but sending it back to the West which changes the form and value and the recognition that the process becomes global”. Since we don’t have proper recycling structures its becoming problem every single day. So as an artist, I am interested in exploring and creating that dialogue in and around the plastic issue, it’s not just plastics but a very research based project." Corporate or government officials can support some of our projects so that the benefit will remain here and not go to the west. Most of the support now are coming from the west but if they should come from my own country, obviously Ghana will be the ultimate beneficiary. Serge wants government to support him by funding some of his projects. “Projects create awareness and before you do that project you need people. You need different hands to work with so I am interested in having the space to work and fund projects. I want to do projects in any other region because I believe that there are different situations there. so I use different materials to address the situation, to create awareness, educate people about what is happening. Yes there are challenges in my line of work this include unavailability of space, and other politics in art. It also includes Politics in Gallery structures, museum structures and even representation of African artists. There are some places and galleries that are not interested in African Arts. And also with the press". Plastic is a major issue globally, if it would be banned then I think we would need an alternative. For me we have several companies producing plastic products and Govt needs to tackle those companies so that they follow up where their final products end, not just at the market where they are littered. So let’s focus on the product, the brand and the measures companies are taking about them. We need to know where these plastics are coming from. We have to rather patronise made in Ghana goods because we import too much and consumption is becoming a problem so we have to tackle it. We need to build a proper recycling structures that will create jobs for the people.